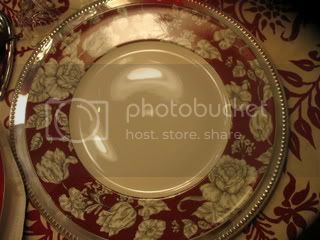 I found these dishes in HG clearance..just 2 that's all they had...They are called Country Toile Red by 222 Fifth..I'd like 2 more..I will keep looking.. I did a quick table while YKW went to the store...I was all out of Sierra Mist Free, my beverage of choice...lovely bouquet..:), so he shopped, I played.. 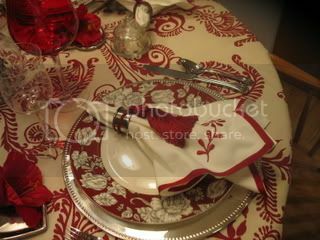 I like the Country Toile Red plates too.... Your entire table setting is over the top gorgeous. Sierra Mist Free ... never had it ...Is it like 7-Up? Yes, Cynthia, like 7 UP but I like it better...made by Pepsi.. Yes, it is a scalloped cookie cutter..had it a long time! Kathleen, you'll never burn me out with your table settings. This one is really pretty! (I'll look for those plates for you!) Yum, cookies and cake! 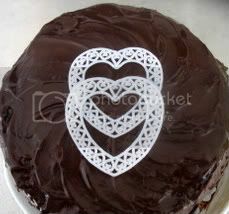 Love the scalloped cookie cutter - you always do an outstanding job on your tables...you could do them every day!!! How could we tire of looking at food and dishes? Have a great daya Kathleen..I love how you add the reart in your writing..I just saw soemone else do that..cute as can be. Kathleen, I never tire of your tables, such beautiful combinations. Just beautiful, Kathleen. As always! I thought that was your first name, LOL! The cookies and cake look super! I wonder if my takeout place has heart-shaped anything? Another gorgeous table. I have fallen so in love with red between Susan and you and Debbie and whoever else has shown us such gorgeous Red things. This table makes me fall even harder! So do you have a fancy way to arrange the duvet cover on the table or do you actually sew it into a table cloth. I need a lesson... The cookies looks so pretty and I'd eat a plate of them myself. Love the ribbon touch. I'll keep my eyes out for your red plates. My drink of choice is Coke Zero. Gotta have my caffeine! I don't drink tons of it though. Maybe a glass a day..kind of as a treat. Hey, you're changing around your header pic... I've seen a couple of different ones this evening... I like them both! I see you're gearing up for St. Patty's! You never cease to Amaze..
Another Beautiful Table. Love the Red Toile. How fun to come home and catch up on all the wonderful things everyone created for V-Day! 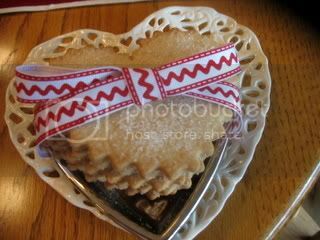 I love the scalloped edge cookies tied with ribbon, so pretty. 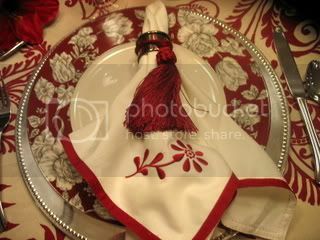 The tablesetting is gorgeous and the new St. Pattie's look to the blog is so cute. 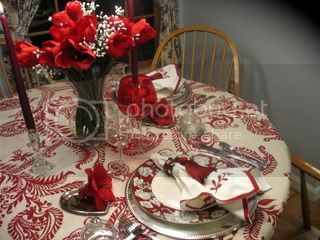 Your gorgeous red and white table is a knockout! So very pretty and festive. 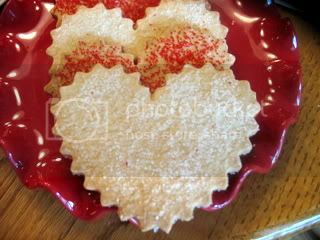 Love the heart shaped cookies too. Unlike Greg, I'll make a piglet of myself and have some of everything! It's a celebration, after all. Kathleen, I just found out you love rock. I never knew. At any rate, your Valentine's Day table is absolutely stunning. I remember when you first showed us that duvet ;) What a gorgeous table!!! Your sugar cookies look amazing too.